Wash the sabudana & soak it in about 3 cups of water for about 5 to 6 hrs. ; preferably overnight. The sabudana will have increased in volume (puffed up). Drain excess water if any. Set aside for further use. Wash the potatoes & boil them in their jackets in sufficient water in a pan or in a pressure cooker till tender. Do not over cook the potatoes. Cool the potatoes, peel off the skins & then grate using a vegetable grater or lightly mash with your hands. In a sufficiently large bowl, mix together the sabudana, potatoes, jeera, grated ginger, chopped green chillies, groundnuts, lime juice, sugar & salt to taste. Add the coriander leaves & mix in lightly. The dough will be a little soft & sticky in consistency. Divide the dough into balls, according to the size of vada you desire. Lightly oil your palms of your hands to prevent the dough from sticking. Roll each ball of dough into a round vada/patty with your hands; flatten it in the centre slightly. Form all the vadas/patties & place on a plate. Then heat vegetable oil in a deep wok/kadhai/pan on med. heat. There should be sufficient oil in the wok for deep frying. To check if the oil is ready for frying, drop a tiny piece of dough into the oil. The dough should rise to the surface immediately & should not change its color. Gently lower the vadas into the wok/kadhai & gently baste them with hot oil from the wok with a slotted spoon. Fry few vadas at a time to avoid overcrowding or the temperature of the oil will drop & the vadas will turn soggy. There should be sufficient space to turn the vadas. Fry the vadas on both sides till golden brown. Turn them over occasionally. Adjust heat while frying as required. It will take approx. 5 to 6 mins. to cook. Use a slotted spoon to lift the vadas. Drain the oil completely & place on a tissue paper to absorb excess oil. 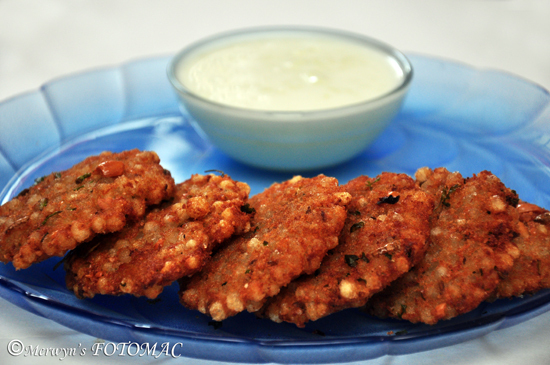 The cooked sabudana vada should be crunchy on the outside & soft inside. Serve hot with coriander chutney or dahi cucumber dip. Whisk curds with a balloon whisk till smooth. Add all the above mentioned ingredients to it & mix well. Serve as a dip with hot crunchy sabudana vadas.